Unexpected vehicle repair costs can really put a dent in your budget. Vehicle expenses typically comprise 15-18% of the average household income and are second only to housing costs and almost equal to what most families spend on food and health care. So, after payments, insurance, and gasoline, there may not always be a lot of money left over to cover unexpected breakdowns, especially major ones. Even a smaller repair such as an alternator can cost $700, while a more serious issue like a transmission or engine can add up to thousands of dollars. And, since most breakdowns tend to occur at inconvenient times, you may be out $100 or more just for roadside assistance or towing expenses. Everyone agrees that unexpected repair costs can be stressful, but there are a few tips that can help you minimize these expenses and protect your pocketbook from the financial strain. Research a car before you make a purchase. It only takes a few minutes to check out reliability ratings and consumer reviews. This information will make you aware of specific problems that certain makes and models are known to experience. And, if you know what to expect, you will be more prepared for the possibility of future expenses. Preventative maintenance. Servicing your car regularly will help preserve all its parts and systems so it will last longer. Proper maintenance will also increase the dependability of your vehicle, decrease the likelihood of unexpected breakdowns, and lower the cost of repairs. Scheduled oil changes will keep the engine healthy, new brake pads will protect rotors from damage, and replacing a weak battery will reduce your risk of a roadside breakdown. In other words, a little bit of regular TLC is a good way to avoid larger expenditures in the future. Have a maintenance and repair budget. Setting a little money aside each month for maintenance and future vehicle repair costs are less stressful than having to pay a large bill from a tight budget. If you own a car, certain expenses are inevitable. And, it is likely that it will break down at some point in time. So, expecting these costs and planning ahead may not minimize the expense, but it will definitely minimize the stress. Estimates. Most people have had the unfortunate experience of taking their car into a repair shop and then receiving a bill that is much larger than expected or several hundred dollars higher than they were quoted. When you take your vehicle into a garage, make sure you get an estimate in writing before you agree to have any work completed. Ask the mechanic to review the estimate with you so you understand what you are paying for parts, labor, taxes, and miscellaneous fees. And, make it clear that they are not to do any additional repairs until they receive your authorization. If you agree to have further work completed, get a revised written estimate. Having a clear agreement will ensure that you are not shocked by an unaffordable repair bill. Compare estimates. Repair costs can vary widely between shops, and larger dealerships will often charge more than independent garages. Taking the time to get two or three estimates can save you a lot of money in the long run, especially on major repairs. Respect your car. Rough driving will put more stress on your vehicle and increase the likelihood of costly damage. Of course, an SUV with off-road capabilities is meant for rugged terrain, but most cars will not fare as well under abuse or misuse. Things such as harsh braking, aggressive acceleration, or flying through potholes at high speeds can really increase your vehicle repair costs. Purchase a vehicle protection plan. The relatively small investment of a vehicle protection plan from autopom! 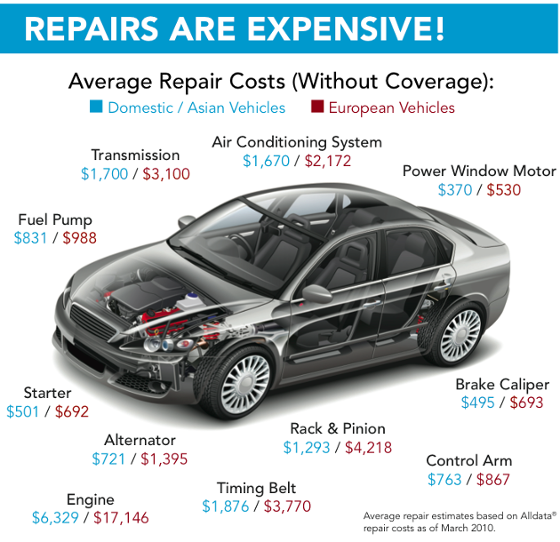 can help protect you from larger repair costs in the future. In fact, in many cases, the cost of coverage is less than the price of fixing a single major issue with an engine or transmission problem. This coverage will help with roadside assistance, car rentals, emergency fuel service, trip interruption, and repair costs so you don’t have to deal with the expense or inconvenience. When an unexpected mechanical failure occurs, a vehicle protection plan will give you some peace of mind knowing that the repair bill will not break the bank. Occasional breakdowns are unavoidable, but following these tips and purchasing mechanical breakdown insurance will help you minimize unexpected vehicle repair costs. Vehicle owners don’t drive without automobile insurance so why drive without a vehicle protection plan? You are a lot more likely to have a mechanical failure than an accident – why not prepare for it affordably in advance?